Wasn’t it just the beginning of summer? I’m not sure how we got here, but yet, here we are. School is starting in just a few weeks and the anxiety is already starting to build. It definitely looks different for each of my kids, but never the less, the anxiety is there for each of them from the toddler to the tween. Truth be told, the anxiety is building up for mom just as much. You’d think each year it would get better and we could adapt the “been there, done that attitude.” Unfortunately, it never seems to be that easy. 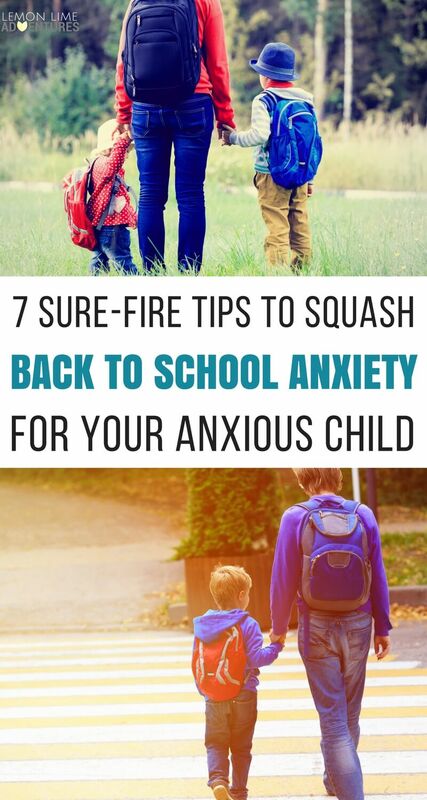 While I never pretend to have all the answers, I have found some pretty solid ways to squash back to school anxiety that has worked for each of my kids (and pretty well on my own mommy anxiety). Anxious feelings are completely normal and even expected during transitions or change. This can especially be true for back to school or first-timers starting kindergarten. You might start seeing an uptick in tantrums, complaints of headaches or stomach pains, and even sullen or irritable behaviors. Will I make any friends? Are my clothes good enough? What if I feel stupid? What if the schoolwork is too hard? What is something bad happens while I am away? You might be nodding your head as you read this but wonder exactly how to make a difference for your child and smooth those back to school worries. Start by making sure your child is taken care of from head to toe and inside to out. No one handles big emotions very well when they are tired or hungry. Anxious children often forget to eat and don’t get enough sleep. Make sure to provide frequent snacks and build in regular routines so that life can be more predictable. In fact, one thing I see skipped over when children are getting ready for back to school is making sure their sensory needs are met. So when you are covering all your bases and making sure your child has all their basic needs met, make sure you give them the support they need for their developing sensory systems. Encourage your child to talk about their worries and fears. Make sure your child knows it is normal to worry (we talk about this a lot in lesson one and even have some fun exercises for you and your child). You don’t need to wait for a course to do this though. You can set up regular times to set aside to talk with your child about their feelings and their worries. We use our nightly family meeting time to chat about our big worries. Waiting until the night before anything never seems to work out as well as when you are well prepared. The same is true for easing your child’s back to school anxiety. In our home, we start early (sometimes even more than a month early) to prepare ourselves for the start of school. We change one item at a time, such as an earlier bedtime, practicing where to hang backpacks, and even increasing our focused time. 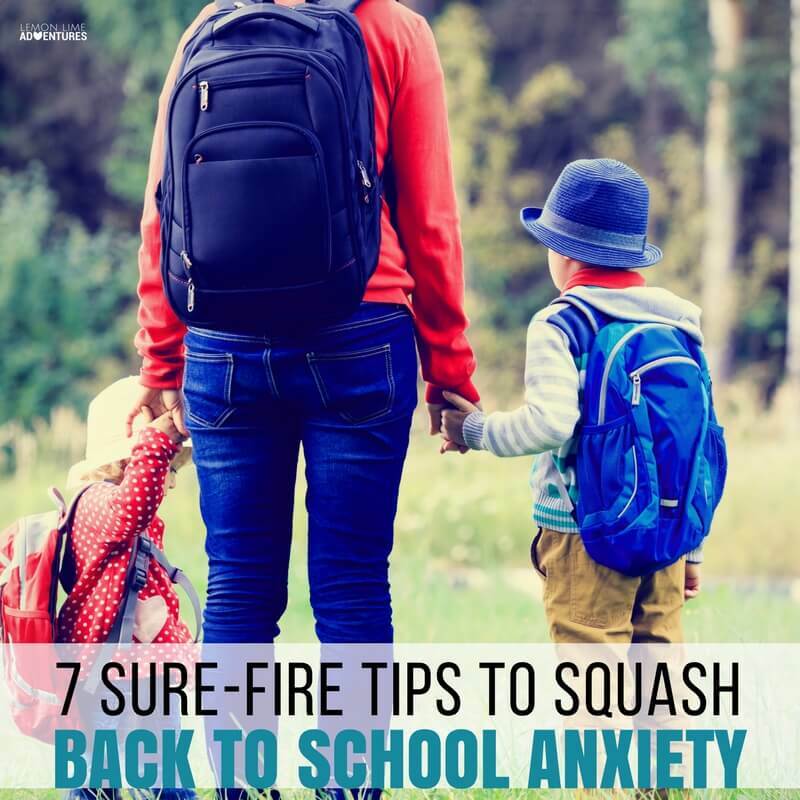 Whether you homeschool or go to traditional school, easing your child into the routines and expectations can lessen the anxiety that comes along with starting school back up. I love this checklist for getting prepared for back to school that starts as early as 2 weeks out. Adding play to your chats can really help your child act out their big feelings. Have them act out their big fears, a mean teacher, or even meeting a new friend. Model appropriate responses and coping techniques your child can try. Here are some great tips for role playing through your child’s back to school worries. Negative thoughts can take over your child’s actions and behaviors. In the Calm the Chaos Framework, we talk a lot about these negative thought monsters and learn how to turn them around. You can do this too. Focus your child on the positives of school. At first this might be as small as a special friend, a snack they get to take, special shoes they get to wear or a book they are excited to read in school. We love this book for talking about big worries and what happens to our bodies when we worry. It is a must have for back to school. You might be tempted to reassure your child that everything will be okay or that there is nothing to worry about. However, to your child, their worries are very real. Instead, address the problem head on and focus on problem solving. “If x happened, what could you do?” Here are some great things to say to calm your anxious child. Finally, you want to build your toolkit. You can’t possibly anticipate every problem that will occur or everything your child with worry about. But you can be prepared. For us, we start early building our toolkit of physical and emotional tools. This ranges from calming tools such as fidgets, calm down jars, and calm down corners to strategies that might not be as tangible such as breathing exercises, mindfulness routines, and family meetings. You might be wondering how to get started with all of these strategies or you might even wish you had help. Dayna, do you think the course is appropriate for preschool teachers? I have children with special needs in my classroom and many of them struggle with anxiety due to sensory needs, communication delays, etc.. I’d love to have more ideas to help them, but need ideas I can use in a classroom setting. I don’t know my kiddos for this year yet, but generally, this is an area of struggle. Thank you! Hi Leah, I actually have had several teachers take the course and love it. I think it is perfect for educators. The language is written for parents but the strategies are still the same.